If you are a fan, like I am, of Robin Hood, then another children’s book on the subject is always welcome. 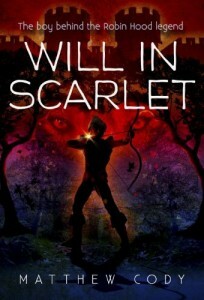 I began reading Will in Scarlett thinking that I was reading about the young boy who was going to become Robin Hood. I didn’t realize until the end, that Will is just another one of the merry men. In that sense, I was a tad surprised that the character of Robin Hood was depicted as having a drinking problem! Nevertheless, the rest of the story about Will was terrific, and of course, Robin Hood becomes a hero half-way through. This children’s book is full of action, and also very informative historically about the situation in England. While it’s not written as a historical fiction, it seems to me that it does deserve to be held that way. It gives a good view of the class disparity, and why it made sense for Robin Hood’s band to rob the rich and give to the poor. The characters are extremely well-crafted, and there is not a moment that we are not fully engaged with their ups and downs. The bad guys get their just desserts in the end. I have to admit I couldn’t put the book down, and I’d include this children’s book for older kids too, for that reason. Because of the historical complexity, I think it’s best for 10 and up. This is not a light-weight book, in the sense that the destruction of war and violence isn’t skimped. But it’s not morbid, just factual. So if you have a sensitive child, this might not be the children’s book for them just yet.